Saying Hello in “cat talk”….playing with a ball of yarn…having a pet for a friend~All of these are fun, playful ways that children learn to interact and communicate. “Meow, Mr. Whiskers”, is part of the series “Child’s Play”, which explores the way that playing is actually children’s work…as they develop and grow-up throughout their childhood! 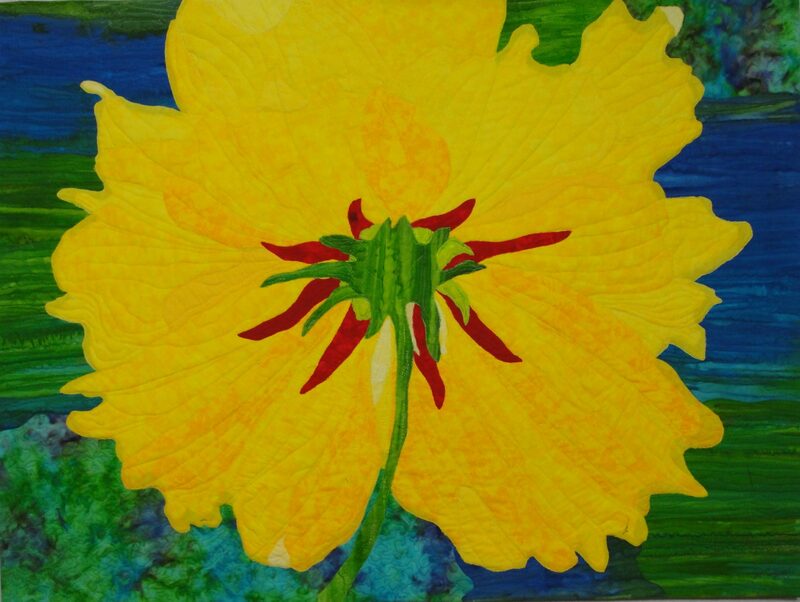 This art quilt is created by fabric collage~using wonderfully, vivid colored cloth to “paint” the design. Thread-painting and quilting lines were used to add depth, details, and more texture. With rolled strands of fabric the artist created a playful, ball of yarn for Mr. Whiskers! Original Art Quilt~”Meow, Mr. Whiskers”. Raw-edge applique, piecing, thread-painting, free-motion quilting, 3-D detail/rolled fabric strips. If you are a collector of unique Art, add this to your collection today….or give it as a gift for a Special Person! *Open Edition, Archival Art Reproduction Prints of this Original Art are also being offered at this time! Please visit us here, in the Studio’s on-line Print Shop!